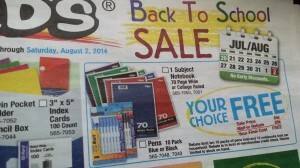 Free School Supplies at Menards After Rebate | A Savings WOW! You can get a lot of free school supplies from Menards after rebate through August 2nd. Get up to 10 packs of pens and 10 notebooks for free. They are $0.89 each and when you submit the rebate, you will receive $0.89 back for each of them in teh form of a Menards merchandise credit check. (I usually use the rebates to pay for the Sunday Chicago Tribune newspapers I buy at Menards for only $1 each). There is also a 3-hole punch for $1.97 after rebate. Stock up on rules, crayons, pencils, and more starting at only $0.59. Don’t forget to check out our list of back to school deals at other stores here for even more savings!